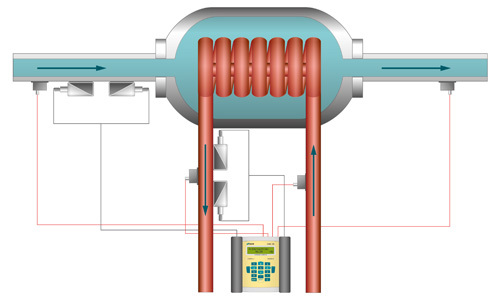 The portable FLUXUS F601 Energy is specially designed for temporary heating and cooling Thermal Energy measurement, with all measurements – Flowmeter, Temperature and Thermal Energy calculator contained in one device and done in accordance with the EN 1434 Thermal Energy meter standard. Like all measuring systems of the FLUXUS series, the F601 Energy measures the volumetric flow rate non-invasively via its clamp-on ultrasonic transducers. Simultaneously, temperature probes monitor the temperatures at the supply and return lines of the heating or cooling system. From the temperature difference as well as the measured volume flow rate and on the basis of the physical media parameters (liquid enthalpy data stored in the meter), the heating or cooling performance is calculated. Simultaneously measure two pipes e.g. chilled and hot water submetering in a building, two chillers at the chiller plant, etc. to allow accurate measurements even at locations that have very little straight run – dual mount on one pipe averages profile disturbance. An important advantage of the FLUXUS F601 Energy lies with its very high zero point stability and unrivalled accuracy even at very low flow rates. 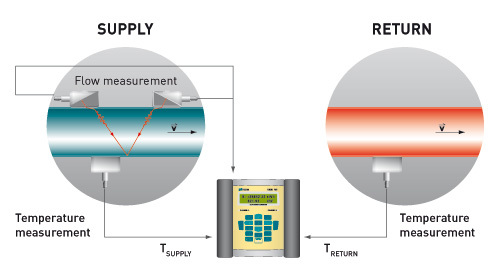 In submetering it is necessary to capture very low flow rates during off peak seasons – like hot water delivery to a building in the summer months – or this becomes free energy. Many meters have zero drift that is hidden by a zero cut-off setting, and some metering technologies just cannot measure the low velocities associated with Thermal Energy off peak flow rates. Another important aspect of the F601 Energy is, that every meter is factory calibrated in a NIST traceable and ISO 17025 accredited flow calibration laboratory. This is a true calibration not a certificate of a bench tested meter that others might supply as an accuracy certification. A critical and sometimes overlooked aspect of the Thermal Energy meter combined performance is the temperature accuracy. Unmatched temperature probes can have a 1°C uncertainty on the temperature accuracy. For a chilled water system with a delta T of 10°C this can represent a 10% uncertainty (error) in the thermal energy measurement. FLEXIM RTD’s are a 4-wire matched pair with an extremely high match of 0.03 °C at 10°C (chilled water temperature). FLEXIM also adheres to EN 1434 standard for temperature accuracy for the full range of temperature measurement. As all of FLEXIM's portable flow meters, the F601 Energy's ergonomic design offers simple handling and maximum ease of use. Its internal Li-Ion battery allows for more than 14 hours of autonomous measurement. Algorithms such as the correction of pipe wall echoes and transducer positioning errors ensure reliable and accurate measurement even in the most demanding application conditions.